On April 24 2017, the Italian provision on transfer pricing, article 110 paragraph 7 of the Italian Income Tax Code, was amended to clearly and definitively define and establish the principle of open-market conditions. According to the amended provision, profit from transactions between Italian enterprises and related foreign enterprises shall be estimated “by reference to the conditions and prices that would have been agreed between subjects operating in open market conditions under comparable circumstances”. The European Union recently took one more step in the worldwide fight against tax avoidance and evasion with the release of the common EU list of non-cooperative tax jurisdictions. The EU black list – the first such list at EU level - includes seventeen off shore countries: American Samoa, Bahrain, Barbados, Grenada, Guam, South Korea, Macao SAR, Marshall Islands, Mongolia, Namibia, Palau, Panama, Saint Lucia, Samoa, Trinidad and Tobago, Tunisia and United Arab Emirates. Italy is hoping its proposed digital sales tax will send a message to the EU and accelerate the process of finding consensus on digital economy taxation. However, the proposal interferes with the EU’s plans and could create double taxation scenarios. Italy hopes to curb tax avoidance by digital companies with a proposal for a new digital sales tax that, if approved, would apply from January 1 2019. The proposal would impose a 6% tax on digital transactions made through electronic means to Italian tax residents with business income, and to Italian permanent establishments (PE) of non-tax residents. This will work out as the buyer paying the service provider 94% of the amount, while withholding 6% for the Italian Treasury. Valente Associati GEB Partners "Best Criminal Tax Team in Italy"
at the Le Fonti Awards & CEO Summit which was held in Milan on November 13. “For the proven experience and solid reputation in the tax consultancy area as well as for the support to Corporate Boards and multinational groups. This acknowledgement is an incentive to continue excelling on our work, to our clients’ best interests, with dedication and passion. An agreement for the automatic exchange of country-by-country reports (CbCR) between Italy and the US (Agreement) came into effect on September 27 2017, as announced by the Italian minister for economy and finance. The above agreement derives its legal basis from Art. 26 of the Convention for the Avoidance of Double Taxation in effect between the US and Italy. For the full ranking list, cf. (http://www.worldtransferpricing.com/Italy/). For the full ranking list, cf. 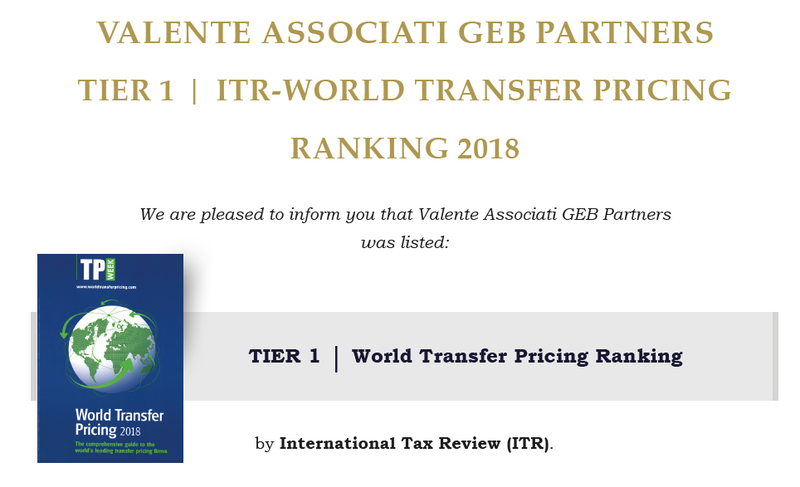 (http://www.itrworldtax.com/firms/valente-associati-geb-partners/valassoc#/rankings). In June 2017, the European Commission released the fiercely debated proposal for a directive to introduce mandatory disclosure rules in the area of taxation (Proposal) in the European Union (EU). The proposed legislation is highly relevant to EU tax professionals but also to enterprises with activities in the EU, implementing tax planning structures that could potentially be regarded aggressive. Specifically, such enterprises may under certain circumstances have own obligation to report information to national tax authorities. In any case, they must be aware that potential tax planning structures they might use shall become reportable and subject to automatic exchange of information among Member States, once the Directive is implemented. The Lawyer Monthly Women in Law Awards celebrate and highlight the achievements of women in the legal profession across the globe. As a result of several months of research and preparation, the Lawyer Monthly Women in Law Awards reward female legal experts that have overcome challenges and inﬂuenced the wider legal profession in their jurisdiction. The winners include all areas of the legal profession, from high achieving junior associates, to long serving barristers. Article 26 of Legislative Decree No. 78/2010 introduced in Italy a rewarding regime related to the non-application of penalties involving intercompany transfer pricing adjustments in connection with taxpayer’s submission to the Tax Authorities of ‘suitable’ documentation to support taxpayer’s transfer pricing policies. Assessment on the ‘suitability’ of such documentation by Tax Inspectors has given rise to a variety of critical issues in the last few years.